Illustration: ‘Indians at Fort Rupert, Vancouver’s Island, July 1851’ Edward Gennys Fanshawe (27 November 1814 – 21 October 1906). Image: Viking sword pommel from Haithabu Museum, Germany. Courtesy Keeshu and Wikimedia Commons. What I remember most about Jacques Cinq-Mars the first time we met was his manner—one part defiance, one part wariness. It was 1994, and I had just flown into the small village of Old Crow in northern Yukon; Cinq-Mars was waiting in the tiny airport. Tall, grizzled, and unshaven, the French-Canadian archaeologist looked every bit the old Yukon hand. Still fit in his early 50s, he worked as a curator at what is now called the Canadian Museum of History in Gatineau, Quebec. But Cinq-Mars lived for summer fieldwork, combing Yukon riverbanks and rock shelters for traces of Ice Age hunters. In three hollows known as the Bluefish Caves, he and his team had discovered something remarkable—the bones of extinct horses and wooly mammoths bearing what seemed to be marks from human butchering and toolmaking. Radiocarbon test results dated the oldest finds to around 24,000 years before the present. Read more at Hakai Magazine. Image from Iconographia Zoologica, Courtesy of Special Collections, University of Amsterdam, and Wikimedia Commons. Haida carving of a European sea captain at Peabody Museum, Harvard University, courtesy of Wikimedia Commons. Image from the Quarterly Journal of Science, 1864. courtesy of Wikimedia Commons. Around 1923 or perhaps a little earlier, one of the Yup’ik inhabitants of remote St. Lawrence Island in the Bering Sea decided to sell this fine ceremonial parka to Arnold Liebes, a furrier from a prominent California family. The Liebes owned a string of Arctic trading posts, as well as an elegant department store near Union Square in San Francisco: Arnold Liebes knew all about high-end fashion and style. So on one of his trips to northern Alaska, he purchased this classic Yup’ik parka fashioned from bleached walrus intestine and ornamented with plumes and orange beak parts from crested auklets. Read more at Hakai magazine. Photo courtesy Hiart and Wikimedia commons. Photo: courtesy Bernice Pauahi Bishop Museum and Wikimedia commons. 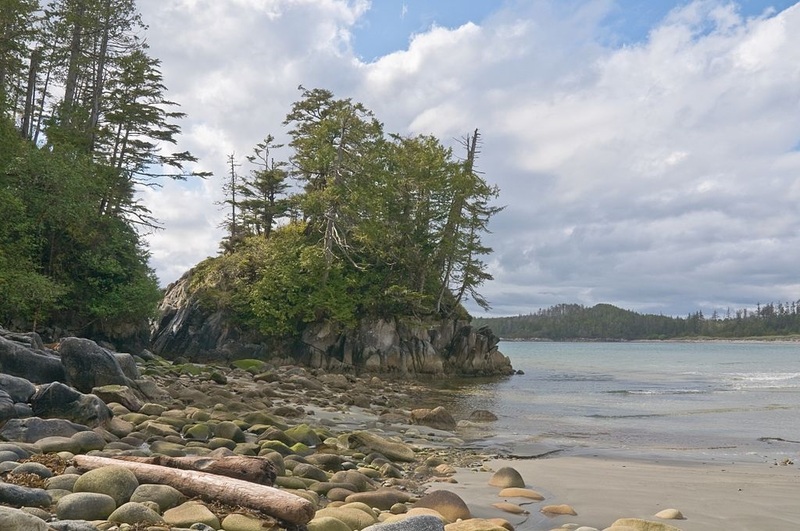 Photo of Calvert Island, B.C. courtesy of A. Davey and Wikimedia Commons.